The Petrie Museum Manager, Maria Ragan, is leaving us next week to head to pastures new as the new Director of the St Barbe Museum and Art Gallery. As a small token of our great affection for everything Maria has done for the Petrie Museum over the past (almost) four years she has been in post, I’d like to offer this beautiful vessel for our Object of the Week – her favourite object in the collection (UC13214). 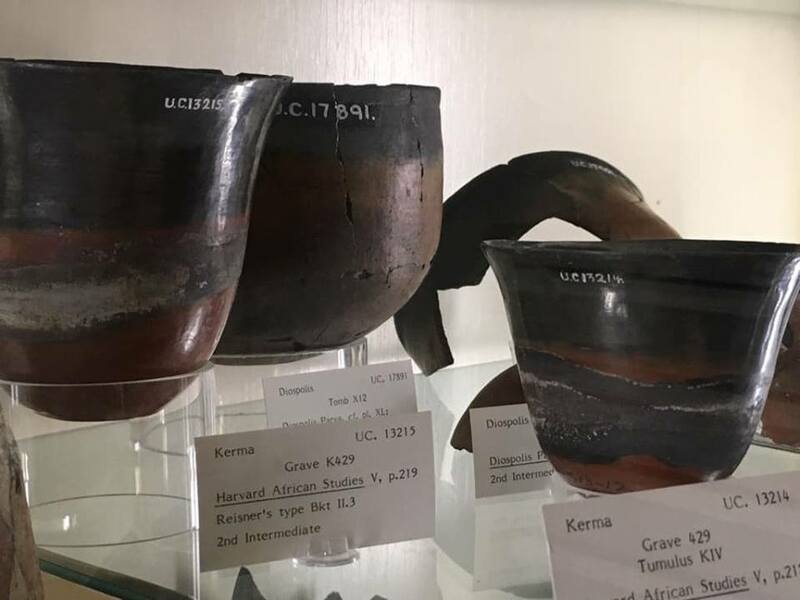 These pots, known as ‘tulip-beakers’, are a distinctive product of the ancient Sudanese Kingdom of Kush, the first urban society in Sub-Saharan Africa which flourished from 2500 to around 1450 BC. The site of Kerma was the ancient capital of the Kushite kingdom and excavations at Kerma have revealed extensive residential and industrial areas, cemeteries, and monumental religious architecture. Tulip-beakers were produced in large numbers from 1750 to 1550 BC, during the period known as ‘Classic Kerma’. These delicate vessels were made by hand using Nile silt, a red-coloured clay which could be easily collected from the fertile banks of the river Nile. Before the vessel was fired, the surface was polished, or burnished, with a pebble, which helped to compact the clay and made the surface very smooth. 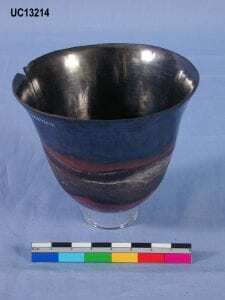 Burnishing also produced the distinctive metallic sheen of tulip-beakers. Importantly, the tulip-beakers were turned upside-down during firing in the kiln which meant that the rim was fired in a reduced atmosphere (without oxygen) and so appears black, leaving the rest of the vessel red: we call these types of pots ‘black-topped red ware’. The delicate tulip-shape of this beaker highlights the technological skill of the Kushite potters, especially as the vessel is handmade rather than wheel-made. These beakers may have been used for drinking, and some tombs contained several stacked inside each other. This little tulip-beaker was excavated from Grave 429 at Kerma by the Harvard-Boston expedition led by George Andrew Reisner, an American Egyptologist and pioneer of early scientific archaeology. It is particularly small—much smaller than the other tulip-beakers in the Petrie Museum collection—and as such it stands out as a very fine example of the craftsmanship of the ancient Sudanese potters. Good luck Maria, and thank you! Anna Garnett is Curator of the Petrie Museum of Egyptian Archaeology, UCL.